Printed leggings Speaking about leggings, we can’t deny that they are comfortable, they’re easy to style and they’re flexible. You can’t find a girl who doesn’t have at least a pair of them. Among all the types of leggings, there is one type that can make your look stylish and fun at the same time. We are speaking about printed leggings. Whether you pick a pair with a floral pattern, a gothic pattern or just something a little simpler, printed leggings are really fun to play around with. You can use them as sweats at home or pairing them with chic long sweater to wear to work or school. They are definitely a statement piece that will make your outfit cool and stylish. Why to choose printed leggings? Here we will give you some tips about wearing printed leggings: 1. Elongate your legs. This can be done in many ways, but wearing heels or wedges is probably the easiest way. Ballet flats will look great also. 2. Keep your top simple. Solid colors and slimming silhouettes will nicely complete your look. 3. Think about the pattern itself. Horizontal stripes can be tricky, as can anything with too many loud colors or big prints. Think about it when you choose perfect leggings for your style. 4. Be confident. Make a statement when you step out in printed leggings. 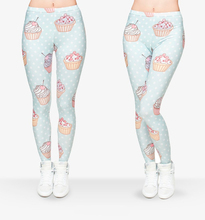 We stock leggings with huge variety of prints. Gothic prints are perfect for fun street wear or a night out with friends. Skeleton and roses leggings are bright, multicolored and a real statement piece. They are both bold and stylish. Our punk printed leggings for those who dare to be different. Flower print leggings will help you feel and look romantic and tender. And of course animalistic prints for those who are not afraid to be in the highlight. Check out more prints right now!